The Contestants: Three amazingly talented students from South Puget Sound Community College Culinary Arts ProgramBe a judge and member of the audience at BSC’s first-ever Olympia’s Next Top Chef! Watch and learn as three of SPSCC Culinary Arts Program’s most talented students compete with an original entree. As with the popular television program “Chopped,” they must use five specified ingredients: turkey breast, Brussels sprouts, pickled sushi ginger, English muffins and Lyle’s golden syrup. You get to judge them on teaching style, taste, visual presentation and creativity. The winner will teach their own class in the spring. 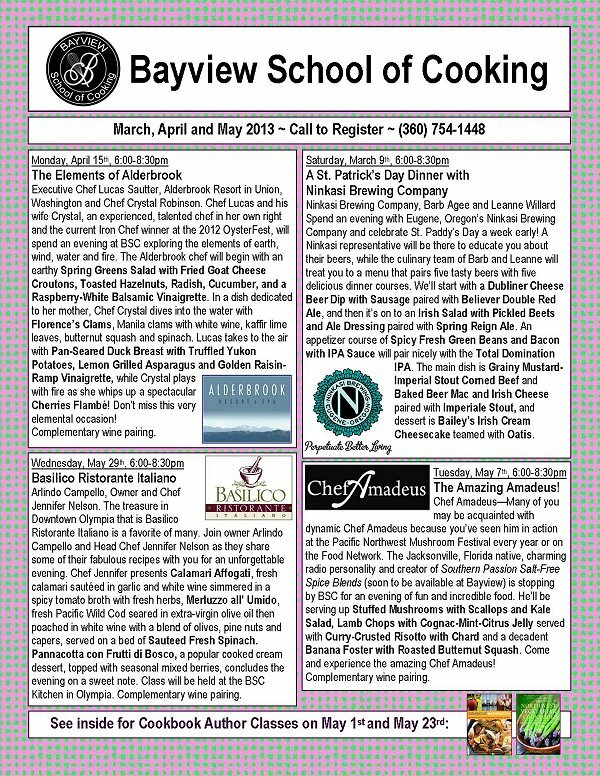 Don’t miss this chance to watch Olympia’s new culinary talent in action! My father passed away a few days ago. He was 92 and after being in a care facility for 4 weeks due to some health issues, he died in his sleep. Given a choice, I think most of us would agree that’s not a bad way to leave this world. My daughter Caroline and I had the privilege of going on a 4-day tour to Catalina Island last fall with my mom and dad. It seemed like my dad enjoyed himself but I was particularly impressed that he enjoyed the food so much. He was always that tall, skinny guy who could eat as much as he liked—the kind we all not-so-secretly envy. Well, at 92 years old, it was apparent that food still gave him joy. I’m convinced that one of the many reasons he married my mom 65 years ago was that she’s always been a wonderful cook. His top favorite dessert had to have been her old fashioned but scrumptious Pineapple Upside-Down Cake served with lots of whipped cream. She made it often because he enjoyed it so much. So, to honor my Dad, I’m sharing her recipe, which was from her mother, with you. May it bring you joy as well. Preheat oven to 350°F. In an iron skillet, melt ⅓ cup butter, add the brown sugar and spread over the bottom of pan. Place pineapple slices on the sugar mixture; one in the center with the others surrounding it. Maraschino cherries can be placed in the middle of the rings. Sift flour, baking powder and salt. Beat together the eggs until fluffy and gradually add the 1 cup of sugar. Gradually beat in the flour mixture. Heat the milk and 1 tablespoon of butter in a saucepan (or microwave) until scalded. Remove from heat and add vanilla. Add all at once to flour mixture and mix until combined. Pour over the pineapple slices in the skillet. The BSC Spring 2013 Brochure is now available!